Helix puts the ball in play against Mount Miguel on Friday. In a combined effort pitching-wise the Vaqueros tossed a no-hitter and offensively pounded out 16 hits in their convincing victory on Friday. Things were rolling for the Vaqueros in the bottom of the first for the Vaqueros as Bailey Olvaeson started off with a single to score Madisyn Wieher (2-3, 2R, 2 RBI), Hannah Davis (R, SB) who stole second advanced to third and scored on a passed ball which made it 2-0. El Capitan extended its lead on a single by Allyson Von Yokes (2-2, R, 2 RBI, SB) which scored Olaveson, a couple batters later Katy Hicks (2-2, 2R, 2 RBI, SB) drove in two runs as she laced a single to center to make it 5-0, Taylor North (3R, SB) walked and Hicks stole third and North stole second, Hicks scored on a wild pitch and Wieher drove in North, Madison Michalek-Rosales (4-4, R, 3 RBI) singled to score Olivia Martinez (1-2, R, RBI). The Vaqueros would add two more runs to lead 10-0 after the first inning. El Capitan added more runs in the bottom of the second inning which included a Martinez RBI single, Wieher RBI single and an RBI single by Michalek-Rosales to make it 13-0. They added their last run in the bottom of the fourth as Michalek-Rosales drove in North. Also contributing for the Vaqueros was Brooklyn Fukushima who went 2-2 and also scored 2 runs. Garnering the victory on the day for the Vaqueros was Wieher who went 2 innings, giving up 0 runs on 0 hits while walking 4 and striking out 2. Coming in to relieve Wieher was Alexa Williams who combined on the no-no going 3 innings, giving up 0 runs on 0 hits while walking 1 and striking out 5 on the day. The Highlanders traveled to Spring Valley and were able to come away with the victory behind some excellent pitching and defense. Offensively the Highlanders took advantage early as Erin Brown singled in the first and Camryn Jonlonis reached on an error with two outs. Both would score as Kasey Castro roped a double. 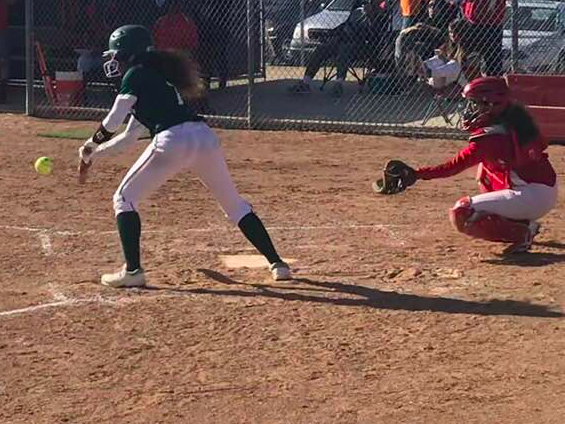 Helix would round out their scoring in the top of the third inning as McKenzie Flores laced a single, stole second and Jonlonis laced a single to score Flores. The opportunities came aplenty for the Highlanders as they hit the ball hard all game with ten of their balls hit hard but to the warning track where the Matadors had their outfielders positioned perfectly to make the outs. For Helix despite the lack of scoring on the day they still got the job done as Laurali Patane limited the Matadors to only a single hit and struck out 13 while tossing the complete game shutout. In quite the pitching gem the Norsemen put things away early as they scored all their runs in the early innings against the Monarchs. Valhalla started off with three runs in the bottom of the first inning and would score six more runs in the bottom of the second inning. The Norsemen on the day pounded out 18 total hits collectively. It was an all-around collective effort which included Victoria Villegas bombing home runs consecutively, Samantha Green going 3-4, Kennedy Labshere going 2-3, Delaney Stettler going 2-3 as did Rylee McMillan and Emily Quesada. Stettler besides helping her cause on the offensive side also in the circle dominated as she allowed a single hit on the day in the victory.